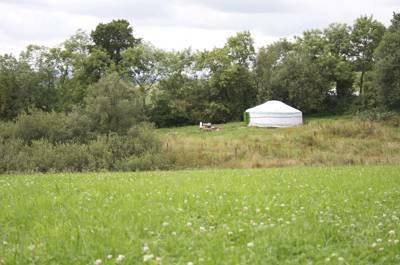 Our unique campsite is set in the peaceful beautiful countryside of rural Devon. Camp above our vineyard with views of Dartmoor where you can join us on a guided tour of the vineyard/winery and taste our wines. For latest availability and best prices for Ten Acres Vineyard, please use the Date Search above. 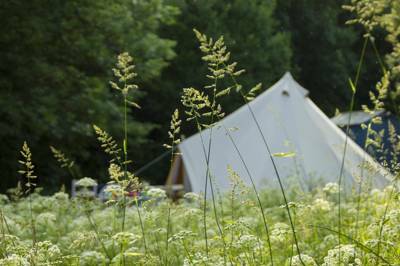 The campsite is situated above the vineyard in a grassy one acre meadow with great views. Onsite is the Devon Wine Shack selling their wines, apple juice, free range eggs and logs, with wine (and apple juice). Guided vineyard and winery tours and tastings on selected weekends. There are 10 pitches – 3 'rent-a-tent' spots and 7 general grass pitches. 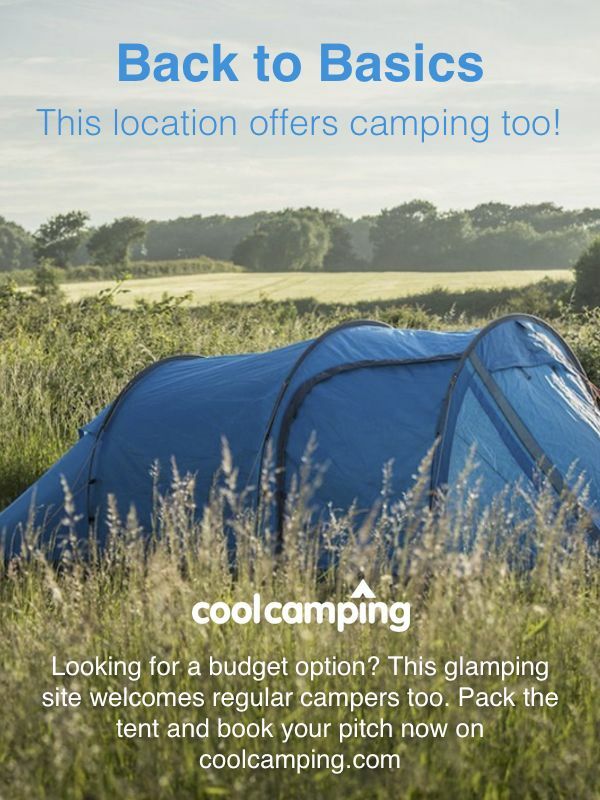 There's also a shower and a compost loo, washing up area, chemical disposal point, and firepits. Logs and kindling can be bought from the onsite shop. There's a play area for children (sandpit, tractor tyres) and a secure place for bikes to be stored if needed. 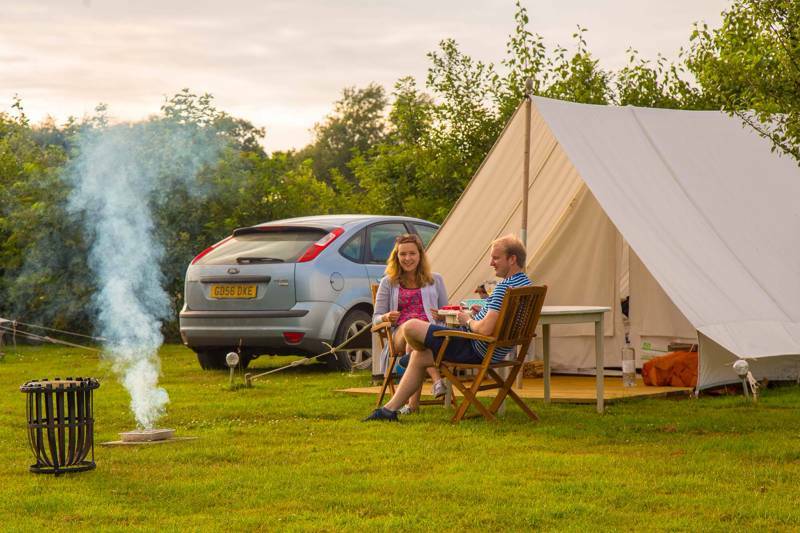 Both the 5m and 4m bell tents have heavy-duty zipped in groundsheets and a large awning and we provide a brazier for cooking/campfires A brazier for off-ground fires is also provided. Chicken, sheep and kune kune pigs to see and, of course, the vineyard – campers are welcome to tour the vineyard any time (self-guided with information provided or £5 for guide). The campsite lies on the edge of Winkleigh which is a small but pleasant place. Drive north to the coastal village of Bideford (01237 477676) with nearby beaches Instow and Westward Ho! or stop along the way at Rosemoor Garden (0845 265 8072) in the market town of Great Torrington. Winsford Walled Garden (01409 221477) is also close at hand, as is Dunsland, a large historic park abundant in wildlife. Finch Foundry (01837 840046) is an interesting National Trust site on the edge of Dartmoor National Park (01822 890414), the last working water-powered forge in the UK, it provides an insight into the areas industrial past. From here its a short step into the national park itself which is, of course, the perfect place for outdoors enthusiasts. The Granite Way (01837 53020) is an excellent purpose built cycleway, ideal for families, while The Two Moors Way is a long distance footpath that runs from Ivybridge on the southern edge of Dartmoor all the way up to Lynmouth on the North Coast of Devon. 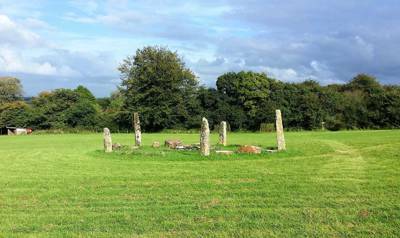 Just west of the campsite you'll also find the start of The Tarka Trail, one of the most famous routes in the area that heads north to Barnstable and the coastal towns. Families may also enjoy The Big Sheep (01237 472366) an award winning all-weather amusement park, while Exmoor Zoo (01598 763352) is also popular, though slightly further away. Winkleigh, though small, has plenty of good shops including a local butcher, fishmongers and a general store, along with a successful Cider Brewery (01837 83560). Fiona's Farm Shop (01837 83382) is the place to go for fresh local meat as well as freshly baked cakes, pastries and Devon cream teas. In the village square, Wright & Proper (01837 83038) is a smart café bistro, while The Seven Stars (01837 83344) is a friendly pub often hosting live music. The Duke of York (01837 810253) in Iddesleigh – a thatched 15th-century inn overlooking Dartmoor with a warm atmosphere and more top grub – is your hosts' personal recommendation. The Lymington Arms (01837 83572) in the neighbouring village of Wembworthy is worth a visit, while The Kings Arms (01837 83384) is a charming 16th century thatched inn that's ideal for a quiet pint. Leave the A30 at Whiddon Down and follow the signs to Winkleigh/Torrington. From the A3124, turn towards Winkleigh village at Zuki's restaurant/takeaway. Immediately indicate right. Then turn at the sign and continue along the track for half a mile. The track is well-signed and will guide you to the campsite. The nearest train station to Winkleigh is Eggesford, 5 miles away. There is no bus service from Eggesford to Winkleigh but there are regular buses to Winkleigh from Exeter and Bideford. The Stagecoach 315 bus stops outside Zuki's restaurant/takeaway (request stop) whose car park is opposite the campsite entrance. It's a half mile walk from the entrance to the pitches. 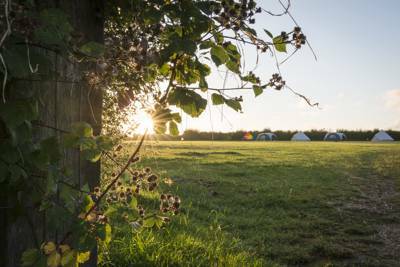 8 tent pitches and 2 campervan pitches in a grassy one acre meadow above a vineyard. 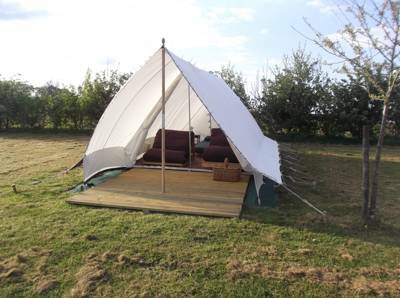 2 unfurnished bell tents with awnings. 5m sleeps up to 6 adults or a large family. 4m perfect for couples. Furnished safari tent sleeps a family of four. Sorry, no dogs permitted in the glamping tents.